These prices are expected to be available until the end of the year. 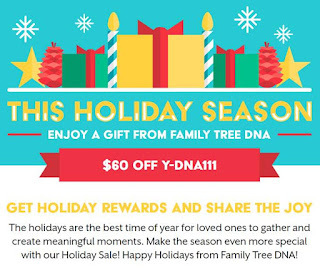 In addition to these great sales prices, FTDNA has added a minor social media frenzy the last couple of years by offering weekly coupon codes each Monday during the sale. They expire the following Sunday. These codes reduce the cost below the above sale prices. 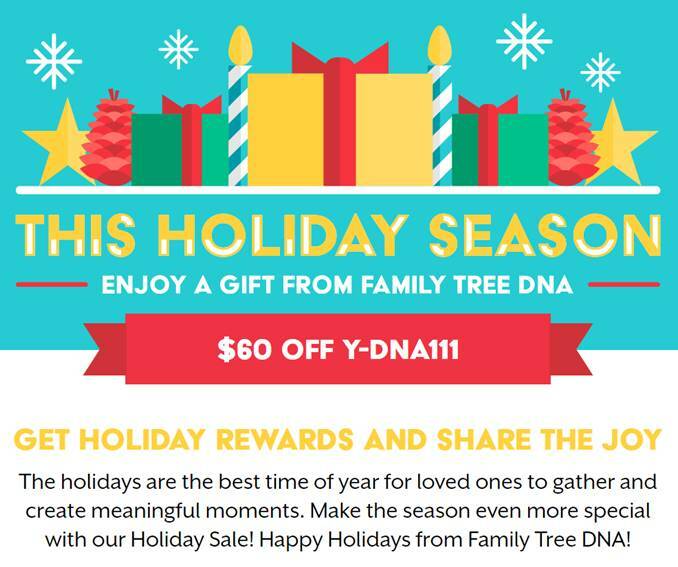 They can be used by the person who receives them on their myFTDNA page OR they can be shared with others. If you receive codes that you know you will not be using, please share them with other family members, fellow DNA project members or the general genetic genealogy community through Facebook. On Facebook it may be better to just state what level of coupon code you have and ask interested people to contact you. These codes can only be used once and then are no longer valid. If you see any other coupon codes, please post a comment at the end of this blog post. The strategy comes in if you are planning to do additional testing but are on a limited budget. How long do you wait for the bigger discounts to show up? There are fewer of them. Is it better to order using a smaller discount which will expire the following Monday or gamble that a bigger discount will come your way some other week? Let the games begin and enjoy the fun as we build our genetic genealogy databases for the benefit of us all. Has anyone seen holiday sales prices for other companies? A secondary marketplace has emerged at https://docs.google.com/.../1CgXRKz2TySvRqSInveSI.../edit... for the exchange of unneeded discount codes. Check there for codes you need and deposit particularly the higher value codes you don't need. Also be sure to mark as "used" any codes you take. These are one time codes and they expire each Sunday night.